NEW ALBANY, Ind. — It is with great regret we announce that Judge Carlton Sanders, longtime friend and supporter of Indiana University Southeast, passed away Monday, Oct. 31, 2016. Sanders, an IU Southeast Chancellor’s Medallion recipient and a member of the Indiana University President’s Circle, devoted much of his life to enhancing the quality of education IU Southeast offers its students. 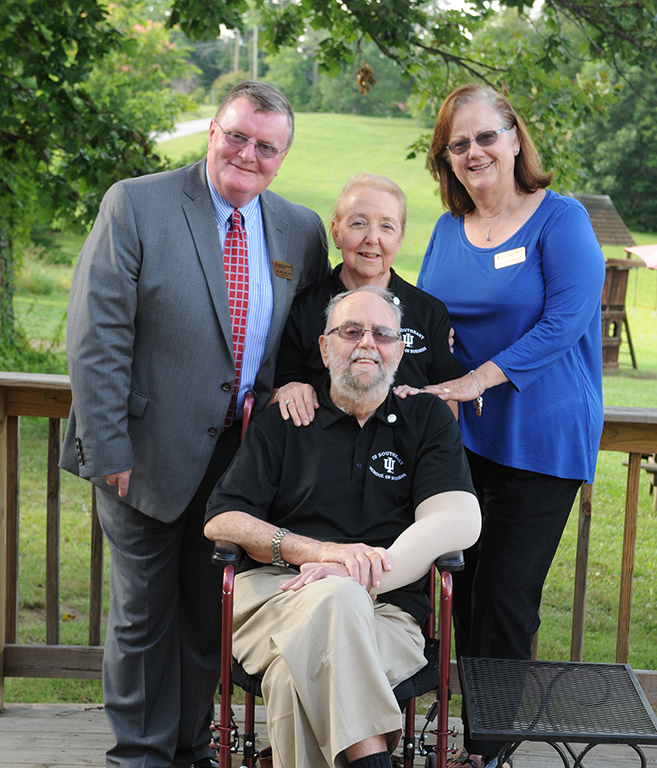 Judge Carlton (front) and Chancellor Ray Wallace, Sue Sanders and Susan Wallace at the President’s Circle Pinning Celebration at Turtle Run Winery in 2015. 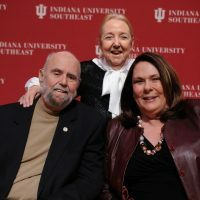 As an IU Southeast School of Business alumnus, Sanders made many significant contributions to Indiana University and IU Southeast over the years. At IU Southeast, Sanders and his wife, Sue, have supported the Honors Program, the Judge Carlton E. and Sue Sanders Chair in Business and Economics and the Sanders Speaker Series Endowment. Together they helped to create The Judge Carlton and Sue Sanders Professional Sales Center, The Sanders Financial Markets Lab, the Judge Carlton and Sue Sanders International Study Scholarship, the Judge Carlton and Sue Sanders Laboratory for Nursing Education. He also served on the alumni board and advisory council at IU Southeast. 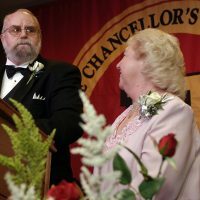 “Judge Sanders was a driving force here at IU Southeast in terms of the many philanthropic endeavors he and his wife Sue were involved in,” Chancellor Ray Wallace said. In the coming months, IU Southeast will dedicate the Judge Carlton and Sue Sanders Professional Sales Center in the School of Business to promote selling skill development in the Kentuckiana region to business and non-business majors alike. In October, the Sanders were on campus to celebrate receiving the Sagamore of the Wabash, the highest honor bestowed by the governor of Indiana, for their service to the state. 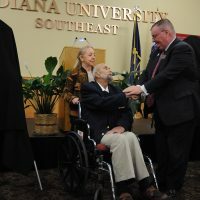 In addition to donating to Indiana University and IU Southeast, he and Sue Sanders also gave back to the Southern Indiana community through involvement in the Community Foundation of Southern Indiana, LifeSpring Mental Health, Metro United Way Harrison County, the Salvation Army and other organizations. We extend our deepest sympathy to the Sanders’ family and acknowledge, with sincere appreciation, his legacy of caring and dedication. Funeral services will be at 11 a.m. Saturday, Nov. 5, at Beanblossom-Cesar Funeral Home in Corydon. Burial will be in St. Peters Lutheran Church Cemetery near Corydon. Visitation will be from 2 to 8 p.m. Thursday, 2 to 8 p.m. Friday and after 9 a.m. Saturday at the funeral home. 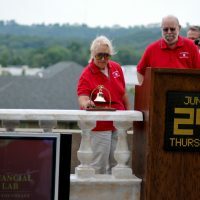 The family requests that expressions of sympathy be made to the Indiana University Foundation for the benefit of Indiana University Southeast. 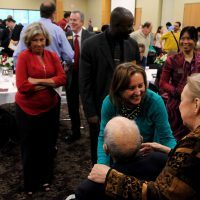 Vice Chancellor for Advancement Betty Russo pins Judge Carlton and Sue Sanders during the Indiana University President’s Circle Laurel Pin ceremony in 2015. Judge Carlton and Sue Sanders accept the 2006 Chancellor’s Medallion. Sue Sanders and Judge Carlton Sanders ring in the opening of the Sanders Financial Market Lab in 2010. Chancellor Ray Wallace, right, shakes the hands of Judge Carlton and Sue Sanders prior to unveiling the Sagamore of the Wabash awards. IU Southeast faculty and staff congratulate the Sanders on their award.